I'm not much of a museum person. Generally when I go into a museum, my primary goal is to see how quickly I can make it through to the other side. For all the time I spent in Paris in 2005, I only made it to one Museum, the Orsay. I never went to the Louvre, frankly the lines scared me away. And in 2006 when I made all those trips into New York, I skipped most of the big museums, only venturing into the Skyscraper Museum down in Battery Park and one visit to the Natural History Museum, which I liked because they had exhibits with mannequins, which is always cool. Plus, dinosaurs. For this reason, despite living for the last year and a bit in London, a cultural capital with a large selection of museums for all tastes, I haven't really been to many of them. I have been to the London Transport museum (because I am a train geek), the Canal Museum (because I like boats) and a visit to the British Museum (because I felt like I had to). Today, though, I was out for a walk and found myself outside Charing Cross Station, looking down the street at the National Gallery and I thought to myself, "I need to go to the National Gallery." So I went. 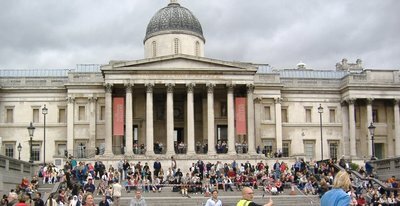 In 2001, in a bid to increase attendance and bring culture to the masses, the Labour government of Tony Blair introduced free admission to many museums and galleries. In London, all the big museums and galleries are free, which means my one visit to the British Museum didn't cost me a penny, though I did drop a pound in the voluntary donation box, because I am good like that. Today, upon spying the National Gallery, it was this lack of admission charge that had me thinking I would go in. See, just a few minutes before, I had been wandering through Charing Cross Station, looking for a free toilet. I had hoped that it wouldn't be the case but was not actually shocked to find that the toilets cost money to use. It is a sad fact that most of the train stations have pay-per-use toilets. Only St. Pancras Station seems to have free ones. Perhaps it is to impress those coming from the continent aboard the Eurostar. We wouldn't want the French to think us too money grubbing. At least not until they've exited the train station and tried to take a black cab. Anyway, Charing Cross wanted £0.30 to use the facilities. Thirty P for a ... pee? Outrageous. Not when there are cleaner and free bathrooms to be had at the museum down the street. So I went to the National Gallery, walked in, walked down the stairs, did my business, and left. That is the story of my first visit to the National Gallery. I wasn't inspired by any of the art, or the beautiful architecture of the building, but I did think the toilet very clean and tidy. Clean toilets. The true benefit of Government subsidised Culture.